Season's greetings! 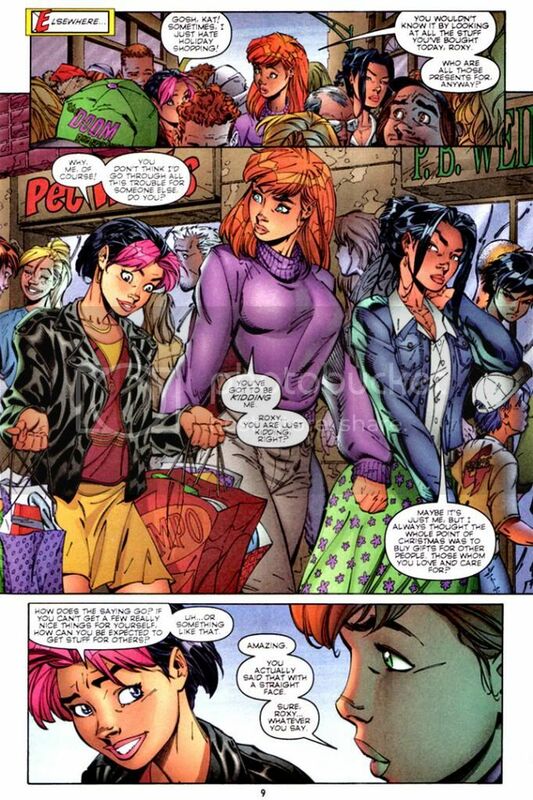 Actually, when I suddenly remembered this moment existed, I was hoping it was within the context more of a holiday-themed Gen13 I could toss at you, but this is the only part of the story in Gen13 #16-17 (January-February 1997) that directly references Christmas. The rest involves the Roxy, Caitlin and Sarah being captured by a fellow "Gen-active," a genius toy company magnate who happens to look and dress like Max from Where the Wild Things Are and will never grow up. So he can mate with them. I'd... uh... forgotten that part. No, Roxy does not learn a seasonal lesson about how it's wrong to be selfish or that it's the "thought that counts." She doesn't find out what life would have been like for her friends if she'd never been born. She doesn't fly off to the North Pole to save Christmas by rescuing jolly ol' St. Nick from his evil twin brother. She doesn't help recover a small town's presents from the anti-Christmas troglodyte who lives just north of there on the top of a mountain with his put-upon animal companion. She learns she doesn't like wearing teddies.